Theater for the 21st century is being born, with Pangea World Theater as midwife. The “Bridges Project” unites different artistic mediums—spoken-word, filmmaking, music, dance and theater—in fresh collaborations. “Patriot Acts,” made by 22 diverse artists (both local and international), crescendos beyond convention to take on today’s crucial post-9/11 issues. “The theme is freedom, drawn from conversations about the world we live in and where our voices are in the dialogue and where they aren’t,” says co-curator/actor Sha Cage, best known as co-creator of Mama Mosaic, the TC women of color theater group. “All we knew is we were going on a journey and we’d meet fellow travelers. We’d break bread together, have dialogue. The project would be fragments of—artifacts from—that journey,” Cage’s co-curator and director e.g. bailey elaborates. 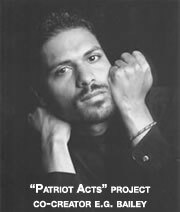 A rehearsal of “Patriot Acts” is an exhilarating evolution: Drea Reynolds’ resonant singing; Amanda Furches’ stark dance; Cage as the Statue of Liberty carrying a flag-covered baby; TC hip-hop icon Truthmaze riffing with videotaped Leeds, England, poet Swan; exhilarating poetry performed choral-style. “Characters” range from BBC reporters and the latest racially-profiled people labeled “terrorists” to historical figures like Harriet Tubman and a 15-year-old African-American girl, Kismet. “Aesthetically it’s like jazz. Group improvisation. Process is the thing itself,” said “Bridges” curator J. Otis Powell, as he explains the “open space” philosophy “Patriot Acts” emerges from. “Patriot Acts” is rebellious art that dares to cross artificial boundaries made by traditional theater and the growing national security apparatus. These artists liberate the term “freedom” from being a pro-war slogan to becoming unleashed creative expression and vigorous dissent. Artistic firepower of this magnitude could be both the mightiest weapon against violence and the transformative means towards reconciliation. $12. Mon-Wed. Nov. 7 to 9, 7:30 p.m. Varsity Theater, 3808–4th St. SE, Dinkytown, Mpls. 612-203-1088. Originally posted on Pulse of the Twin Cities.